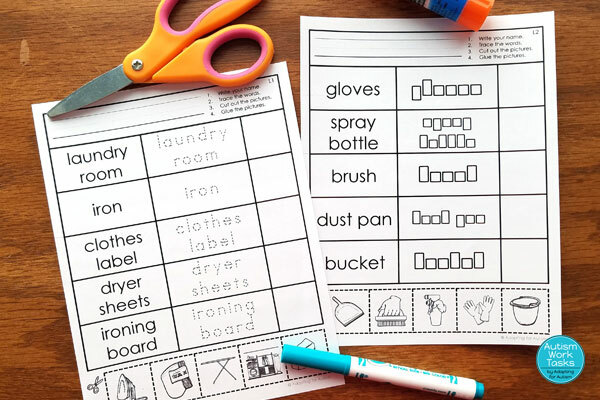 The list of life skills our students need to learn seems never-ending. 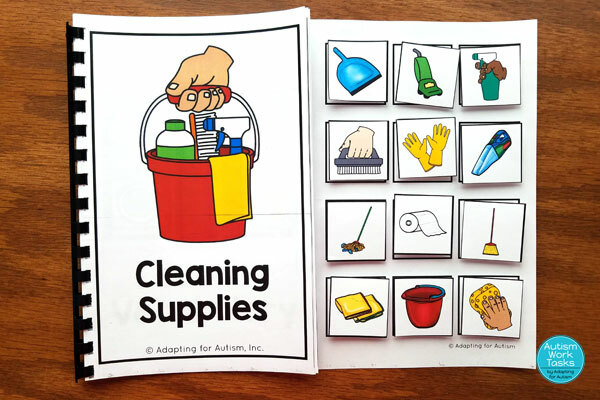 One skill that will benefit their families NOW and help them with independent living in the FUTURE is learning household cleaning and chores. 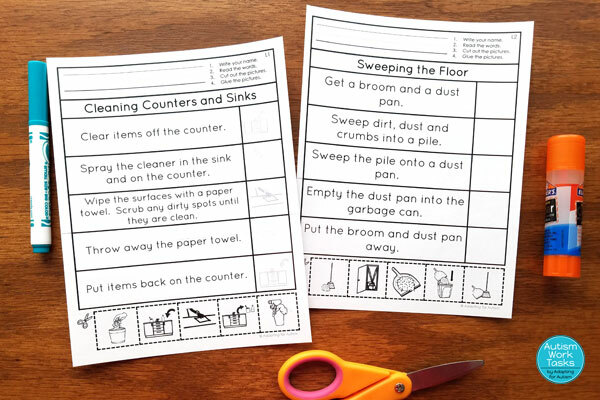 Despite my best efforts to wish away the mess on my desk or come home to sparkling floors, I’m inevitably left to do it myself and our students will too. 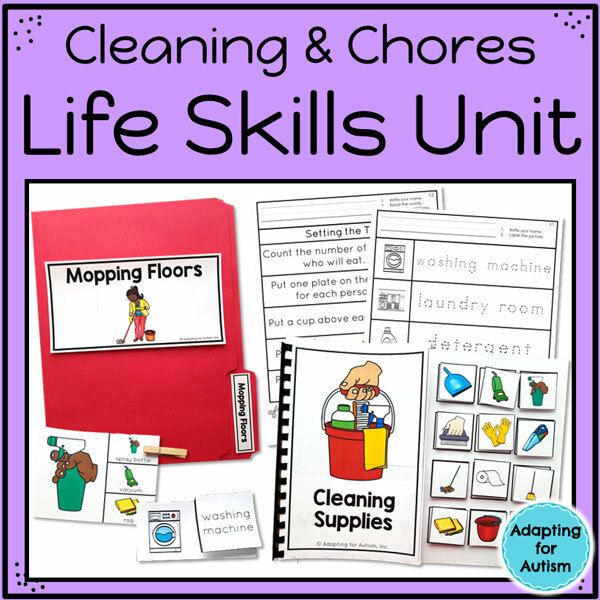 Teens in particular should be learning to manage and clean their space as they are now physically able to use cleaning supplies and tall enough to reach into the washing machine! 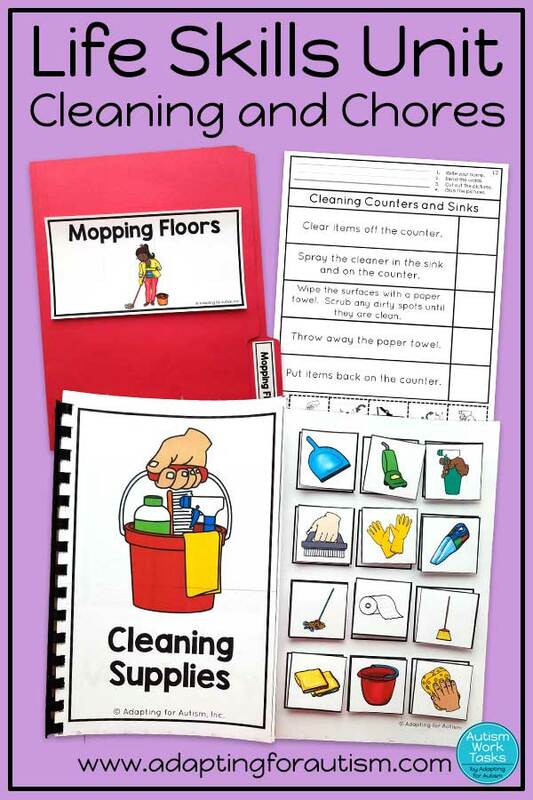 Here’s a list of simple cleaning supplies to keep in your classroom. Of course, they don’t apply to every classroom depending on your set-up! 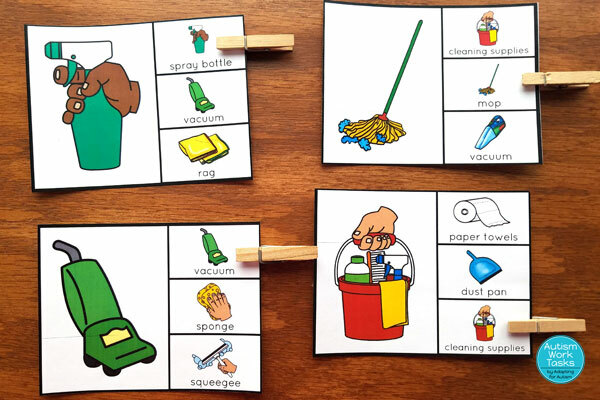 In addition to physically practicing cleaning skills, we can use academic time to reinforce vocabulary and procedures. 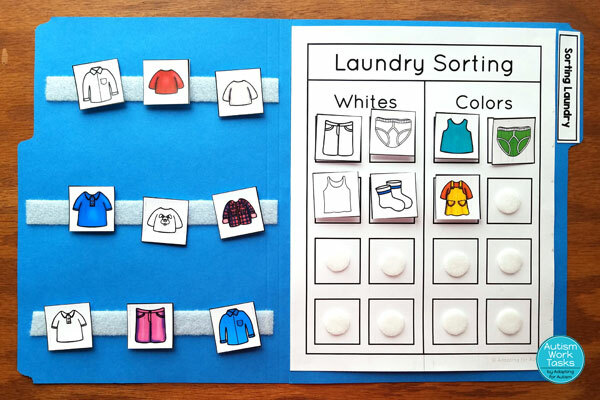 I created this huge unit of life skills activities to supplement hands on training. 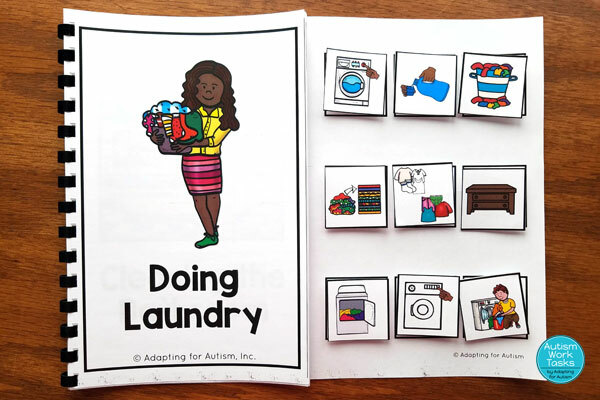 I focused on cleaning supplies, laundry supplies, and completing basic household chores. Specific cleaning chemicals need to be taught in the natural environment in your hands on training. Some cleaners and some surfaces don’t always match up (for example, I can’t say use multi-purpose cleaner on the kitchen counter, because it may be granite and require special treatment). I used generic terms like spray bottle and glass cleaner instead! 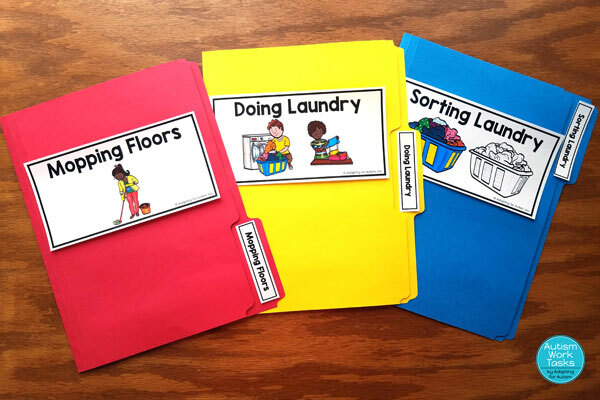 File folders are my favorite task type and I believe many students thrive on the left to right routine and clear completion criteria. 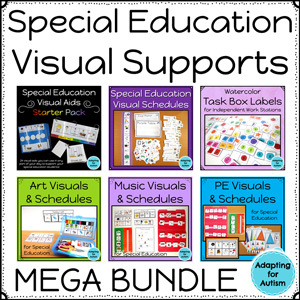 This unit includes 19 file folders to match, sort and sequence. 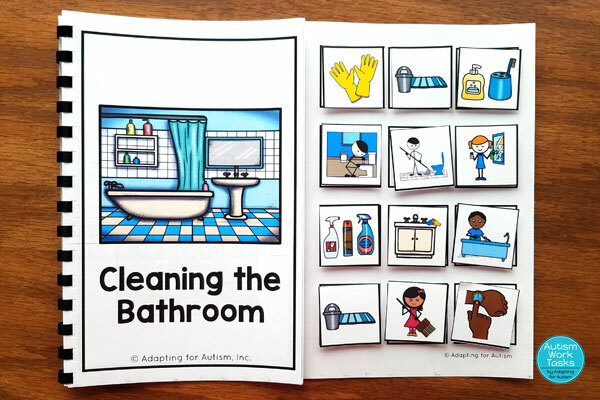 Adapted books are a great way to include life skills in your reading groups. 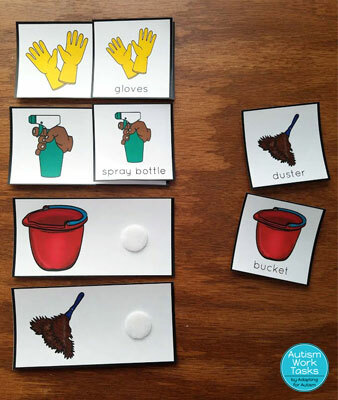 Students practice navigating and reading a simple book while matching cleaning items. I may have gotten carried away with the worksheets. I just kept thinking of more ways to practice! 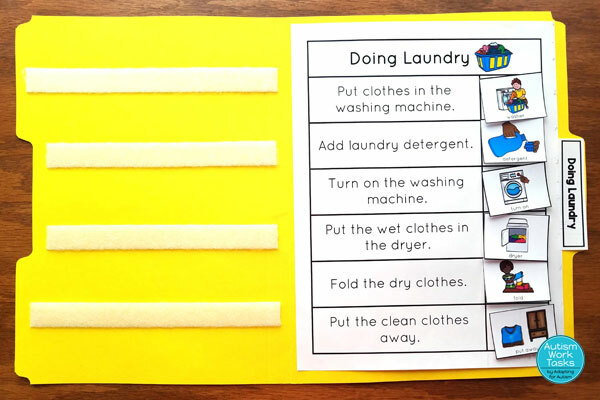 Most tasks have multiple levels so students can trace or write independently. 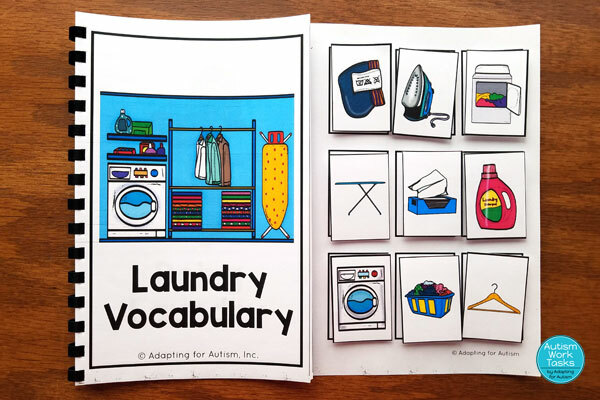 They can match pictures or match pictures to words. 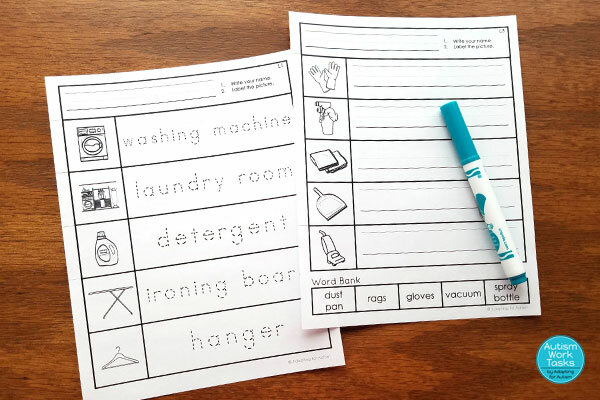 I particularly love creating cut and paste worksheets to sneak in some fine motor practice! 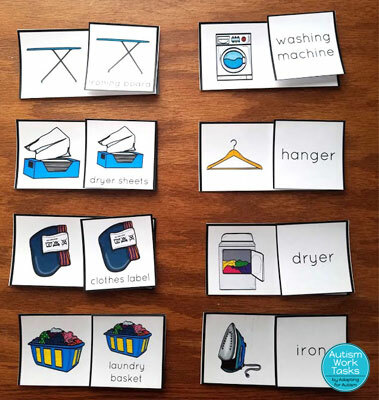 These matching tasks are similar to the file folders but you can limit the field by reducing the matching cards and answer pieces you present at one time. If you have a student working in a field of 2, you can only give two answer cards at a time and progress from there. Eventually they will be ready to complete 12 piece file folders! Adding a little fine motor to a work task never hurt anyone right? 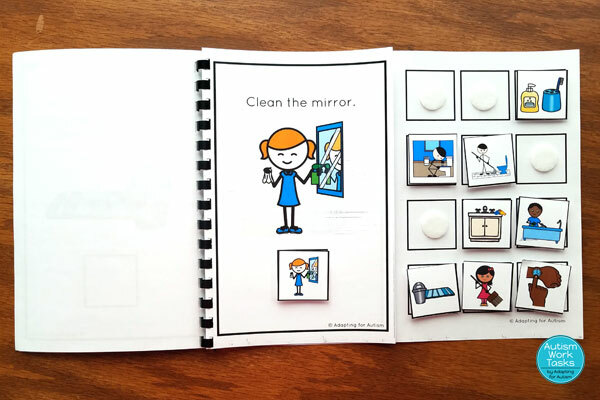 I included a picture to picture match and a picture to word match in this unit. 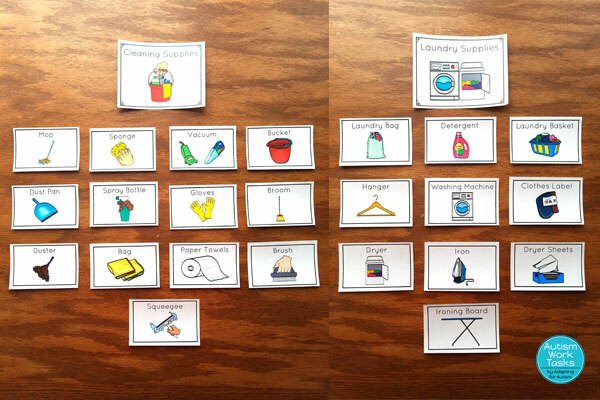 If you’re using these tasks to build a unit and you have the space, I created two word walls you can post. I included cleaning supplies and laundry supplies. 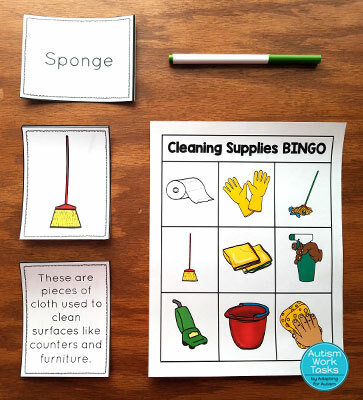 Who doesn’t love a good cleaning supplies BINGO game!?!? I made three sets of calling cards – picture to picture match, picture to word match and picture to description match. 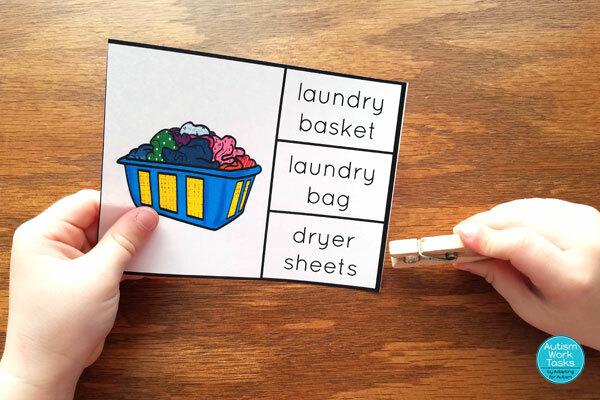 ← Stop Laminating Everything in your Classroom!